This Aspen Snowflake Blue Dog Sweater features a classic design with a distinctive snowflake pattern. An upscale feel and distinguished design sets this sweater apart from the rest! 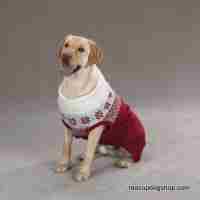 The dog sweater has a ribbed knit turtleneck, sleeves and hem for cozy and comfy fit. Care: Machine wash cold on gentle cycle. Line dry.